It was a busy 12 months for business news in Canada, but that didn’t stop BNN’s anchors and reporters from picking up some extra reading throughout the year. 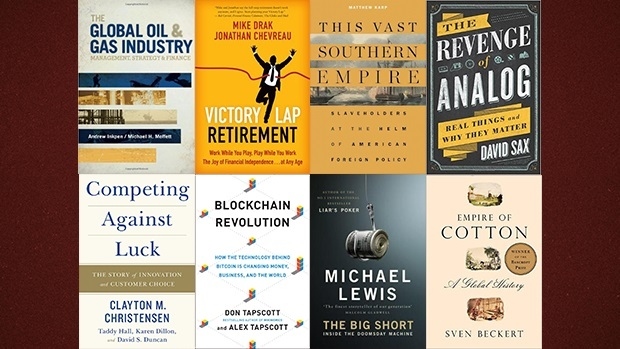 Here’s a list of some of their financial book recommendations for 2016. ]Retirement as we once knew it doesn't work anymore. I've always believed once you have your financial house in order it would free you up to do the things you love to do and would help to give your life more meaning and balance. Imagine the luxury of working because you want to — not because you have to. No one wants life to be a series of takeaways. This book reinforces my desire to stay in the game. After retiring from TD Bank Financial Group where I enjoyed working for 33 years, I am loving and personally thriving on my "victory lap." This book is a new way to define retirement and a must-read if you are looking for strategies to retire right. Even though the book was released in 2010, it is still a must-read today. It exposes how raw greed governs the markets and how average investors saving for honest retirements pay the price. It’s not a book about what happened in the 2008 global financial meltdown. It’s a book about what will keep happening to those who don’t manage risk in their portfolios. It’s not just aging baby boomers looking for nostalgia who are snapping up vinyl records, paper notebooks and even old-fashioned analog film in ever greater numbers. One of the most surprising trends detailed in David Sax’s latest book is just how young buyers of entirely non-digital products are getting, raising the hopes among those who still love real, physical things that they are not going away entirely. Fascinating historical details and intriguing questions about the future make this a must-read for anyone without a computer science degree who nonetheless wants to start an innovative new enterprise with a devoted, younger following. In his 1997 book ‘The Innovator’s Dilemma,’ Clay Christensen popularized the term “disruptive innovation.” In ‘Competing Against Luck,’ Christensen re-examines the role of the customer in making todays disruptors (Amazon, Netflix, Uber, Airbnb) successful. Beckert, who has been hailed as “one of the new elite of genuinely global historians,” documents the seminal role of this one commodity in shaping our modern world and capitalism itself. The production of cotton cloth and garments helped ignite the Industrial Revolution. And there’s a dark side: Europeans paid for slaves with cotton and shipped the captives across the Atlantic to cultivate the crop. We interviewed Beckert on BNN in late 2015. This book is easy to read and simply lays out the big issues and players in the oil and gas industry. It's worth reading especially as Canadians continue to struggle with the balance of protecting the environment while exporting more of our natural resources. And it's timely! A recent senate interim report on pipelines recommends improving public knowledge on pipelines to help Canadians better understand projects and processes.